Enios Eatery is a small restaurant located South Portland Maine just a stones throw away from our beloved Willard Square. Inspired by the small trattorias in Florence we have tried to capture the warmth and comfort of the eateries throughout the neighborhoods of Italy. While our menu is strongly inﬂuenced by the Italian culture, we also celebrate our love of Maine with our commitment to local farmers, ﬁsherman and suppliers. By using “local folks” we are able to keep our menu seasonally current and offer new menu items often. Many items that we offer are served “alla brace” or from the wood grill while others are pastas and grains tossed with classic sauces and local seafood and produce. To round all of this out, we have complemented our cuisine with our All European Wine list and craft beers available on draft and in the bottle. We invite you to come join us…eat, drink wine, relax and enjoy Maine while dreaming of Italy…. I grew up in an Italian family with strong roots in the Abruzzo region. But we all lived in Connecticut, and every Sunday three generations would gather in the home of my father’s parents, our beloved Nonnie and Tatone. I have such warm memories of the table overflowing with delicious handmade ravioli, dried sausages and rustic homemade wines. I have inherited the “grandmother gene,” and continue these traditions as I live my life and cook my pasta. 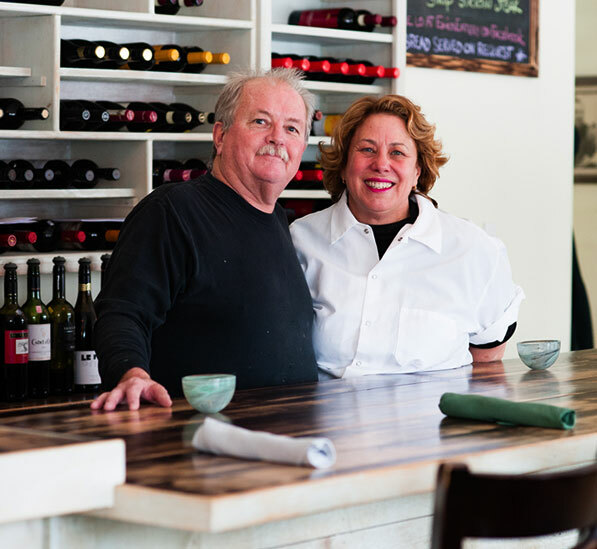 Those traditions were the inspiration for the first restaurant I opened with my husband, Robert. We named it Rachel’s for Robert’s mother, and owned and operated it successfully in two Portland locations for nearly 15 years. We closed Rachel’s and took a brief sabbatical in Florida … but soon realized we had to return to Maine. Today we continue the tradition of serving the wine while offering rustic pastas and grains complimented by grilled meats and the freshest seafoods. This time, we named our restaurant Enio’s, for my father. Mangiate—vi sentirete meglio … eat—you will feel better. Though our nationalities are different, my wife Laura and I have similar childhood memories. I come from a French country background. My mother’s family owned two small businesses in Rhode Island. My uncles and my mother ran the family grocery and liquor stores while my grandmother cooked for me and my cousins. We lived near Narragansett Bay, and favorite memories include digging fresh clams, eating Rhode Island bluefish and frying fresh potatoes. These meals couldn’t have been better … unless we were lucky enough to get a steak from the grocery store! But even then, fresh fish and hard shell clams were my go-to meal. These days, Laura serves them as pasta con vongole e pesce … or pasta, with clams and fish. At Enio’s, I select our wine list and choose local beers for our taps. For years, Laura and I were lucky enough to take annual trips to Italy. Because of our travels, I must admit my true loves are Italian varietals. Some of the labels are from winemakers who became friends over the years, and they hold a very special place in my heart. But I do enjoy offering all types of European wines. After all, paired with Laura’s cooking, any of our wines will make for an evening well spent. Un bicchere di vino vi sentirete meglio … have a glass of wine, you will feel better. Share a wonderful meal with someone you love! To order, contact us.